At Fox & Lillie, we believe Australian woolgrowers are some of the best-practiced farmers in the world and we continue to demonstrate this point to our international clients. Fox & Lillie continues to meet the modern consumers’ demands for the wool products in which they buy, with consumers becoming increasingly interested in the provenance of products they want to buy, specifically products that are traceable, sustainable and ethically sourced. The OEKO-TEX STANDARD is a worldwide, consistent, independent testing and certification system for raw, semi-finished, and finished textile products at all processing levels, as well as accessory materials used. This global certification system assures manufacturers, sourcers, brands, retailers and consumers around the world that certified products meet the strict limit values for harmful substances of STANDARD 100 and that these substances are not present in critical concentrations. 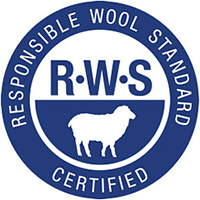 Fox & Lillie continues to stay at the forefront of developments within the industry and as such was one of the first wool exporters in the world to obtain certification under the Responsible Wool Standard (RWS) and can now supply RWS certified greasy wool and RWS certified wool tops. The Responsible Wool Standard is an independent, voluntary standard developed by a broad spectrum of interested parties, including farmers, land conservation experts, supply chain members, industry associations, as well as apparel, home and carpeting brands. On farms, the certification ensures that sheep meet the Five Freedoms and also ensures best practices in the management and protection of the land. Through the processing stages, the certification ensures that wool from certified farms is properly identified and tracked. Fox & Lillie recognises that Australian woolgrowers are at the forefront of production of the best apparel wool in the world. Fox & Lillie continues to build supply of RWS, assisting our woolgrowers to become certified to increase the supply of RWS certified wool. For woolgrowers wanting more information on how to become involved, please contact your Fox & Lillie wool representative. For brands who wish to build RWS wool into their supply, we believe we are the best positioned to assist you with the procurement of suitable RWS certified wool to meet your specifications and needs. If you have any enquiries on sourcing RWS wool for your supply chain please contact trading@foxandlillie.com.au.